It’s almost garage sale season, when eager homeowners everywhere are convinced that SOMEBODY will pay good money (maybe two bucks!) for that toaster that sort of works and the clock that quacks like a duck every hour. Let’s be optimistic and assume there’s a willing buyer for all your unwanted stuff. 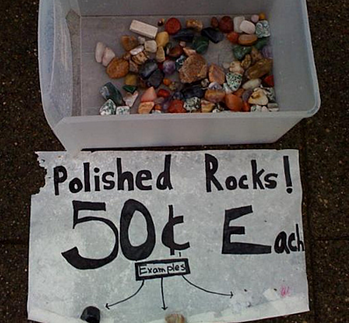 The next step is knowing what NOT to do when you launch your garage sale. There’s more to this time-honored art than piling all your merchandise in the driveway and hoping for the best. Memorize these eight garale sale tips and your next sale might be a sell out. People hate this. Nobody wants to go to the extra trouble of asking you how much something costs. Customers also wonder if you decide on the price after you size them up and take note of how expensive their shoes look. Yes, it takes time to tag each item. But skip this task, and you’ll lose sales. Remember, potential customers are looking for your garage sale signs from their car as they drive by — not right next to the telephone pole with their reading glasses on. That small sign you wrote out with a pen might as well be invisible. Use big, bold letters and numbers and direct people exactly where to go. If that jigsaw puzzle is missing a couple pieces, don’t sell it. Scrap it. Nobody wants that kind of aggravation or disappointment. Make sure your items are in decent shape. These are garage sale shoppers, not members of Tiffany’s Frequent Buyers Club. We’re all looking for a bargain. Plus, you want to get rid of this stuff, right? Price it to sell. Start with the one-third rule: price things one-third of what you paid new. Research prices in your area. Drive around to a few sales in the weeks before yours to check out typical prices. Price slightly high, to leave room for haggling. Everybody likes to feel they got a deal. 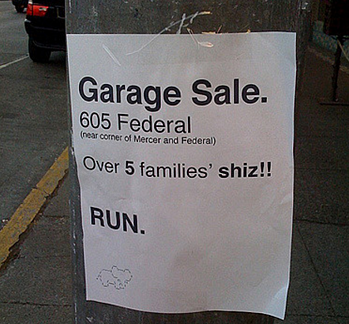 If you only have a few things to sell, don’t bother with a garage sale. Customers are drawn to sales overflowing with goods. If you have a few paltry items in the middle of your driveway, nobody will stop. Consider joining forces with a neighbor or two to add oomph to your sale. Be prepared. Not everybody shows up to a garage sale with quarters, ones and fives. Be ready for the guy with a $50 bill who wants to buy your $3 garden hose. You can roll your eyes after he leaves. You want so many people at your garage sale that a bidding war breaks out over that ceramic poodle your Aunt Myrtle gave you. But that won’t happen unless you spread the word every way you know how. Put up lots of sturdy signs. Shout about it on Facebook to your friends, family, neighbors, you name it. Tell people at work and at school. Advertise on Craigslist. There’s no such thing as too much publicity. Customers don’t want to waste time pawing through huge messy piles of goods. They have at least three others sales to get to before all the good stuff is gone. Create separate areas for men’s, women’s and children’s clothing. Display similar items together. Take the time to arrange your items so customers can see them and quickly size them up, and you’ll sell more. It’s a sad, sad thing to carry your pathetic piles of unsold junk back into the house. Don’t do it. Arrange for a Bin There Dump That dumpster to arrive post-sale, and all you have to do is throw it all in. Better yet, just walk it all in, through our convenient rear doors. When it’s time for our friendly operators to pick up the bin, you don’t even have to be there. 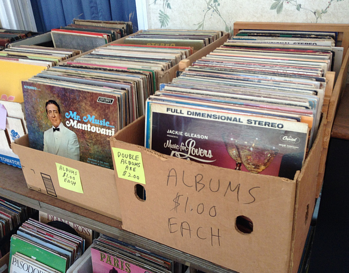 We know you’ll be out spending your new garage sale riches. When it’s time to clear out, call a franchise operator near you.